FlashFirebug (now Flash Debugger) gives you the ability to debug any AS3 Flash on the web. Inspect the DisplayList, change properties on the fly and see the warnings, errors and traces directly in the extension. Use the inspector to hone in on elements, transform objects on the fly and use the console to run AS3 commands. FlashFirebug (now Flash Debugger) gives you the ability to debug any AS3 Flash on the web. 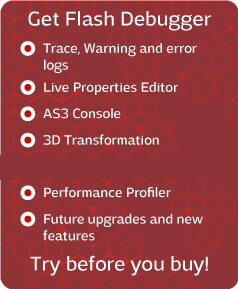 Inspect the DisplayList, change properties on the fly and see the warnings, errors and traces directly in the extension. Use the inspector to hone in on elements, transform objects on the fly and use the console to run AS3 commands on the active SWF.